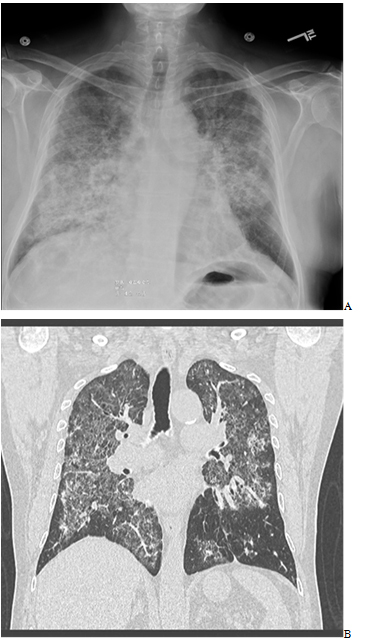 A 59-year-old man with a past medical history of hypertension and paroxysmal atrial fibrillation presented with upper respiratory tract symptoms including cough, rhinorrhea, pleuritic chest pain for 10 days and worsening dyspnea on exertion for 3 days. He was found to be hypoxemic by his primary care physician and was sent to the emergency department. Eight months prior to this presentation, he was diagnosed with paroxysmal atrial fibrillation. At that time he underwent cardioversion but was readmitted 3-4 weeks later for atrial flutter. Given the need for multiple cardioversions, antiarrhythmic therapy was initiated with amiodarone 200 mg orally daily. Three weeks later, he presented with symptomatic atrial tachycardia and was found to have pericardial effusion with early tamponade. He received a second cardioversion and a pericardiocentesis of one liter. He was maintained on amiodarone 200 mg orally once daily. In the emergency department he was saturating 79% oxygen on room air with mild respiratory distress. He was afebrile and normotensive. The neck was without jugular venous distension. Chest exam was remarkable for diffuse expiratory rhonchi. Cardiac evaluation showed a regular rate andrhythm; normal S1 and S2; and no rubs, murmurs. The abdomen was nontender, without organomegaly or masses. The extremities showed no edema. Laboratory data was significant for a white cell count of 14.1K. Chest radiography (CXR) showed bilateral diffuse alveolar/interstitial infiltrates. Urine antigens were negative for Streptococcal pneumonia and Legionella, blood and sputum cultures were negative. Chest Computed Tomography (CT) scan showed extensive intralobular septal thickening with ground glass opacities in a crazy-paving pattern in both lung fluids sparing the periphery (Figures 1 and 2). Figure 1. A-Chest radiography (CXR) showed bilateral diffuse alveolar/interstitial opacity. B- CT Chest Computed Tomography (CT) scan showed extensive intralobular septal thickening with ground glass opacities in a crazy-paving pattern in both lung fluids sparing the periphery. Figure 2. Histopathology from patient’s lung biopsy shows foamy macrophages in the air spaces and cytoplasmic lammellar inclusions are characteristic for amiodarone exposure. Due to the concern of possible toxicity, amiodarone was discontinued. The patient was started on ceftriaxone and azithromycin for community acquired pneumonia, as well as oseltamivir for influenza-like symptoms. Over the next 24 hours, oxygen requirements worsened from 2 to 5 liters per minute. Video-assisted thoracoscopic lung biopsy was performed and the patient was started on IV steroids (Figure 2). Histopathology revealed findings characteristic of amiodarone exposure; foamy macrophages in the air spaces and cytoplasmic lammellar inclusions. Amiodarone lung toxicity was diagnosed after excluding other infiltrative lung diseases. Antibiotics and oseltamivir were discontinued. Patient’s oxygen saturation improved slowly after starting the steroids and his oxygen requirements decreased. He was discharged with oxygen and oral steroids tapper after a long hospital course. Amiodarone is an antiarrhythmic agent commonly used to treat supraventricular and ventricular arrhythmias. Its half-life is prolonged about 45 days. Multiple side effects had been reported in multiple body organs in which pulmonary toxicity being one of the most critical ones [1,2]. Amiodarone induces several forms of pulmonary toxicity ranging from mild to fatal complications; including chronic interstitial pneumonitis, organizing pneumonia, solitary lung masses and acute respiratory distress syndrome. The mechanisms of amiodarone-induced pulmonary injury are incompletely understood. Two major hypotheses include direct cytotoxicity and a hypersensitivity reaction [1-3]. Toxic effects of amiodarone for the lungs are usually observed with higher cumulative doses typically exceeding 400 mg daily for several months. Amiodarone has a long half-life with a high tissue affinity for the lung. The prevalence is estimated to be about 5%. The accumulation of cellular drug-phospholipid complexes that interferes with normal cellular metabolic pathways which ultimately leads to direct cell injury and death explains the pathophysiology for lung toxicity. Both apoptotic and necrotic cell death have been implicated. Chronic inflammation results from cellular injury; while persistent insults can ultimately lead to fibrosis. Another mechanism was referred to a hypersensitivity reaction, but it is less understood, but it is suggested in patients who presents with features of a hypersensitivity pneumonitis [2,4,5]. Risk factors for amiodarone lungs toxicity are uncertain but may include mainly: a high cumulative dose, a daily dose greater than 400 mg, a duration of therapy exceeding two months, patient’s age above 60 years, preexisting lung disease . CT chest remained the optimal radiological tool for diagnosis. Discontinuation of amiodarone should be considered once toxicity suspected as the first step in management. Adding steroids should be considered for use in cases of symptomatic toxicity. 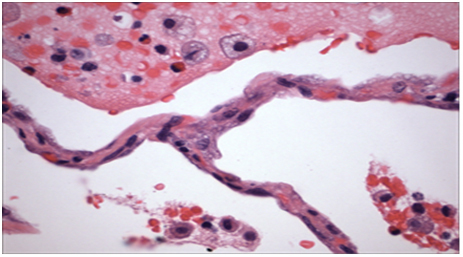 Foamy macrophages in the air spaces and cytoplasmic lammellar inclusions are characteristic histopathological features for amiodarone exposure. Diagnosis mainly made by exclusion of other infiltrative lung diseases. Patients who might benefit from amiodarone should be chosen wisely with starting with the lowest effective dose possible. There is no optimal guidelines to follow up on these patients but a documented decline in the diffusing capacity of greater than 20% is useful in suggesting the need for closer monitoring or for further diagnostic testing. Most of the time testing includes pulmonary function test and radiological imaging starting with CXR . Amiodarone can induce lung toxicity even at low cumulative doses. Although the onset of symptoms is usually insidious, it may sometimes presents acutely, mimicking acute pneumonia, such in our patient. Amiodarone induces lung toxicity even with lower accumulated doses. Discontinuation of amiodarone should be considered once toxicity suspected as the first step in management. Patients who might benefit from amiodarone should be chosen wisely with starting with the lowest effective dose possible with close monitoring. ©2015 Salhab M.This is an open-access article distributed under the terms of the Creative Commons Attribution License, which permits unrestricted use, distribution, and reproduction in any medium, provided the original author and source are credited. Hematology/Oncology Fellow, University of Massachusetts School of Medicine, USA.